Rhodiola rosea, also called golden root and roseroot, has a traditional medicinal role in the harsh mountainous climates of Russia, Scandinavia and Tibet. Rhodiola is considered an adaptogen, meaning it has non-specific qualities that help people deal with physical and mental stress. Some research supports health benefit claims for rhodiola, but the studies are of limited quality, according to Drugs.com. Side effects associated with this herb are rare and generally mild, and it does not interact with many substances. Consult a qualified health care provider before beginning any herbal therapy. Rhodiola rosea may help relieve mild to moderate depression and mental fatigue, explains Drugs.com. Because adaptogen herbs have stimulating effects on physiological systems, rhodiola may be able to improve mental and physical performance. Additionally, laboratory and animal research indicates that rhodiola has anti-cancer effects, according to Drugs.com, including inhibiting growth of tumors and preventing the spread of cancer to other areas in the body. Rhodiola alters levels of brain chemicals, including dopamine, serotonin and norepinephrine, which are types of monoamine neurotransmitters, explains the Memorial Sloan-Kettering Cancer Center. Rhodiola likely inhibits the enzyme monoamine oxidase that is partially responsible for monoamine degradation. Antidepressants called monoamine oxidase inhibitors also have this effect. You may not be able to safely take rhodiola rosea if you also take a prescription MAOI medication, cautions Medicor Labs, a manufacturer of herbal supplements under the brand Clarocet. Rhodiola can have additive effects to MAOIs, including worsening side effects. Additionally, because large doses of rhodiola can be sedating, taking rhodiola with certain other drugs can cause drowsiness. These drugs include benzodiazepines and many other medications prescribed for depression and anxiety. Most people do not experience side effects when taking rhodiola, and there are no reports of toxicity, according to Drugs.com. Some people may experience headache, stomach or intestinal discomfort, dizziness, drowsiness or difficulty sleeping when taking rhodiola, says Medicor Labs. Rhodiola has no apparent contraindications, although no research has shown whether the herb is safe to take during pregnancy. 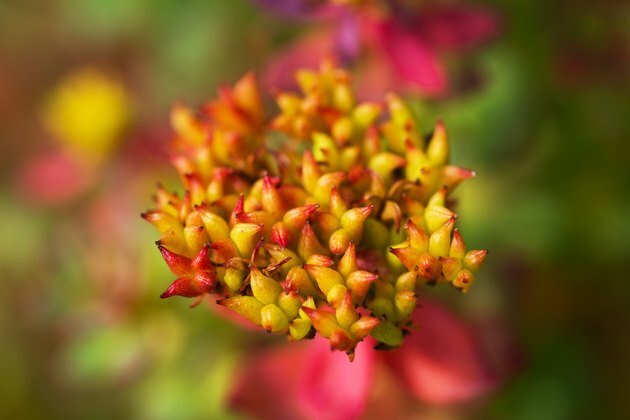 Rhodiola contains chemicals specific to this plant called rosavin, rosin and rosarin, along with another beneficial component known as salidroside. Most studies with rosea extract have used a product standardized to at least 3 percent rosavins and 0.8 to 1 percent salidroside, which is the ratio of these chemicals in the plant itself, notes Drugs.com. Some standardized extracts contain up to 6 percent rosavins and up to 2 percent salidroside. A standard dose is 100 mg to 300 mg daily.